The Admiral Launch Duo explores new sounds for harp and saxophone. Equally at home in acoustic and electroacoustic settings, saxophonist Jonathan Hulting-Cohen and harpist Jennifer R. Ellis have developed their repertoire through ground-breaking commissions, unexpected transcriptions, and improvisation. They have collaborated with composers including Angélica Negrón, Dylan Arthur Baker, Matthew Browne, ChristineHedden, Jasper Alice Kaye, Natalie Moller, Patrick O’Malley, and Stephen J. Rush. Fresh Inc. Festival alumni and four-time residents at Avaloch Music Institute, the Admiral Launch Duo has performed nationally. Committed to creative scholarship, they have presented at the inaugural Northwestern University New Music Conference (NUNC! 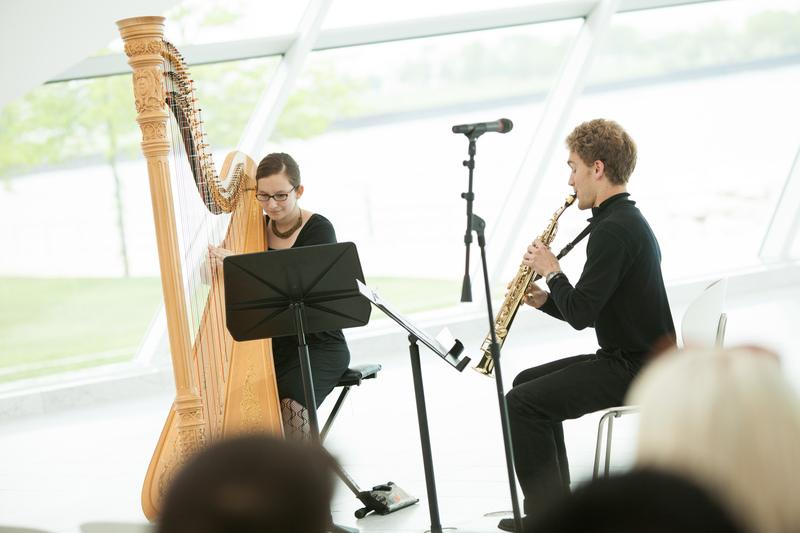 ), North American Saxophone Alliance Biennial Conference, Humanities Education and Research Association Conference, International Harp Festival, and the American Harp Society Summer Institute. They were 2016-2017 fellows of the UMass Interdisciplinary Studies Institute, exploring musical themes of trespass and premiering a piece they commissioned for harp, saxophone, and electronics by Angélica Negrón. The Admiral Launch Duo enjoys working with students of all ages and has worked with high school students on both coasts of the United States as well as given master classes at University of Arizona, Michigan State University, and Schenectady County Community College. They take a comprehensive and versatile approach to community engagement, collaborating with the Cal State East Bay Aphasia choir, University of Michigan Social Justice Art Festival, UM-CAPS Suicide Prevention event, and The Friendly Kitchen, a soup kitchen in Concord, New Hampshire. Past appearances include performances at Center for New Music (San Francisco), Michigan State University, The Hartt School, Kerrytown Concert House (Ann Arbor, MI), Schenectady County Community College Chamber Music Series, UMass Amherst, Listening to Ladies Concert Series at Kalamazoo Piano Company, Harps Etc. (Walnut Creek, CA), CSU East Bay, University of Arizona, and Arizona State University. As recent awardees of the FRG/Healy Grant, their debut album will be released in early 2018 on Albany Records. During the 2017-2018 season, they will premiere a new work by Greg Wanamaker and perform fifteen short premieres in collaboration with Vox Novus.